THIS ITEM IS NOT AVAILABLE AT PRESENT. WE WILL NOT BE GETTING ANYMORE Star Wars Rogue One Scarif Stormtrooper and Moroff Action Figure Set. From the Star Wars Rogue One collection by Hasbro. 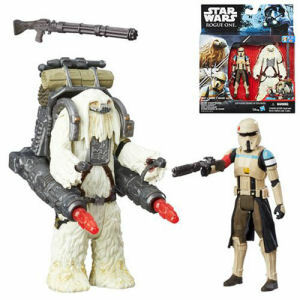 Star Wars Rogue One Scarif Stormtrooper and Moroff Action Figure Set. These 3.75 inch scale action figures come with character specific accessories and have 5 points of articulation.